Upto Which Rank Can An Aspirant Get Into IAS, IPS or IFS? Around 10 lakh aspirants apply for UPSC Civil Services Exam, every year. But what is the last rank that can fetch an aspirant the prestigious IAS (Indian Administrative Service)? The answer lies in the number of vacancies reported for each year and the category an aspirant belongs. 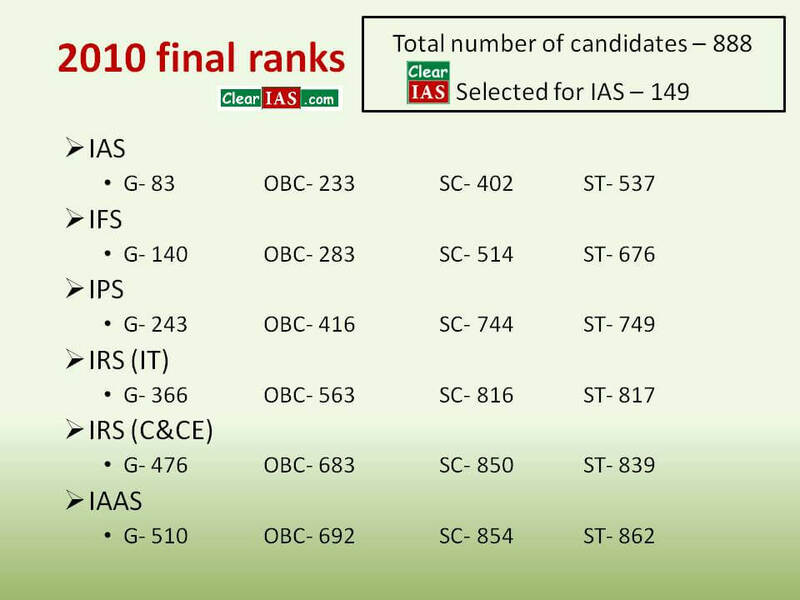 IAS – The last rank of a general category candidate allocated to IAS was 105. 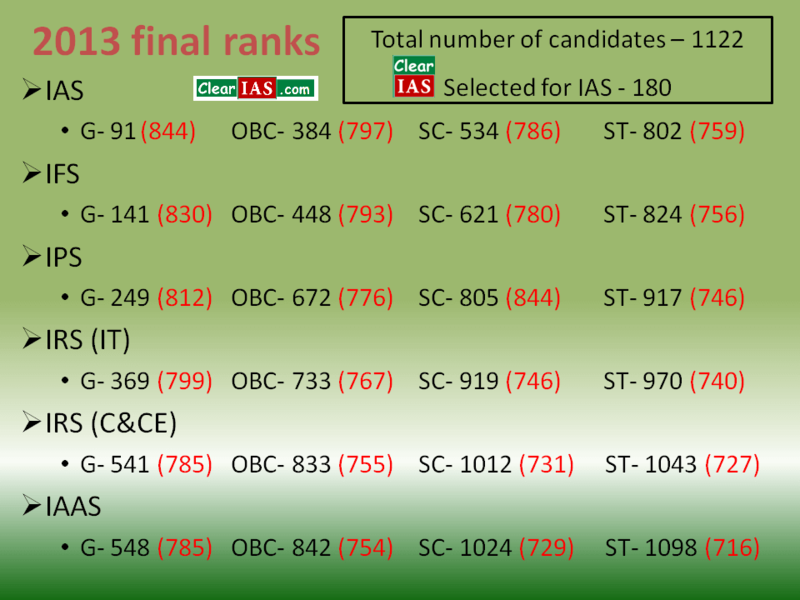 IFS – The last rank of a general category candidate allocated to IFS was 152. 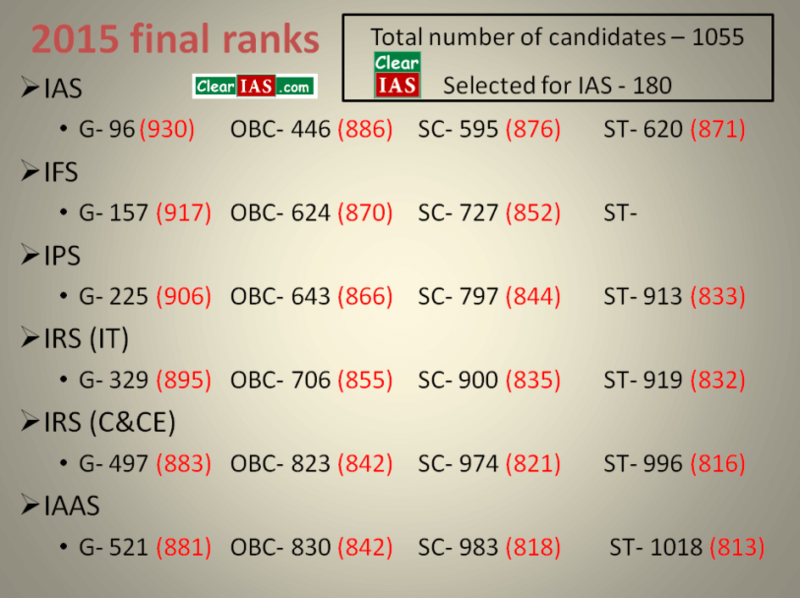 IPS – The last rank of a general category candidate allocated to IFS was 245. IRS (IT) – The last rank of a general category candidate allocated to IRS (IT) was 329. IRS (C&CE) – The last rank of a general category candidate allocated to IRS (IT) was 358. How many vacancies in total? In 2017, as per the UPSC notification, there were only 980 vacancies for all 24 civil services. However, vacancies increased to 1058 at the time of announcement of UPSC results. Names of 990 candidates were mentioned in the main list, out of which 867 candidates were allocated by DoPT for various services. 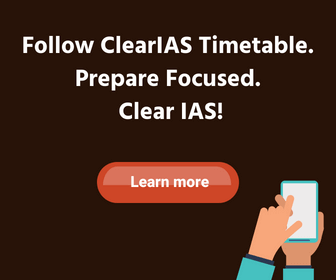 A comparative analysis will help aspirants get a good idea about the cut-off ranks for IAS, IPS or IFS. 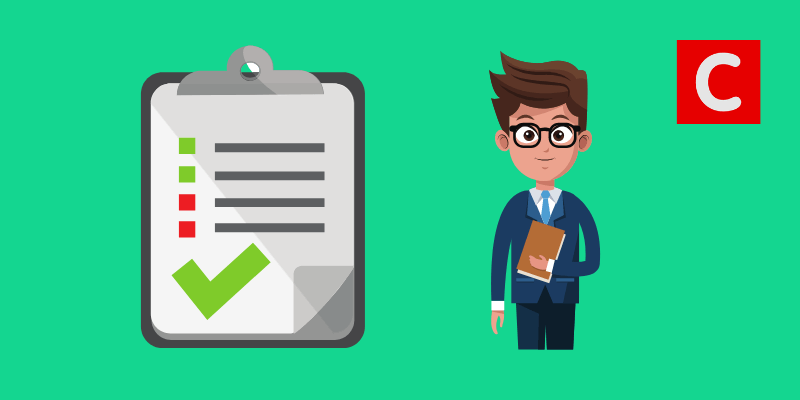 In this post, we present the final ranks for six services (IAS, IPS, IFS, IRS-IT, IRS-C&CE and IAAS) from each of the categories – general, OBC, SC, and ST – for last 9 years (from 2007-2015). 2015: Final Rank Allocated for IAS, IPS, IFS etc. The figure marked in ‘black’ is the final rank while the figure in ‘red’ is the total marks of the candidate. In 2015, 96 was the last all-India rank, which fetched a candidate belonging to the general category IAS. The candidate had secured 930 out of 2025 marks. At the same time, the last OBC candidate who secured entry into IAS had an all-India rank of 446 with a total 886 marks out of 2025. The last rank which fetched IAS was 595 and 620 for SC and ST respectively. 2014: Final Rank Allocated for IAS, IPS, IFS etc. The figure marked in ‘black’ is the final rank while the figure in ‘red’ is the total marks of the candidate. In 2014, 95 was the last all-India rank, which fetched a candidate belonging to the general category IAS. The candidate had secured 953 out of 2025 marks. At the same time, the last OBC candidate who secured entry into IAS had an all-India rank of 466 with a total of 905 marks out of 2025. The last rank which fetched IAS was 650 and 773 for SC and ST respectively. 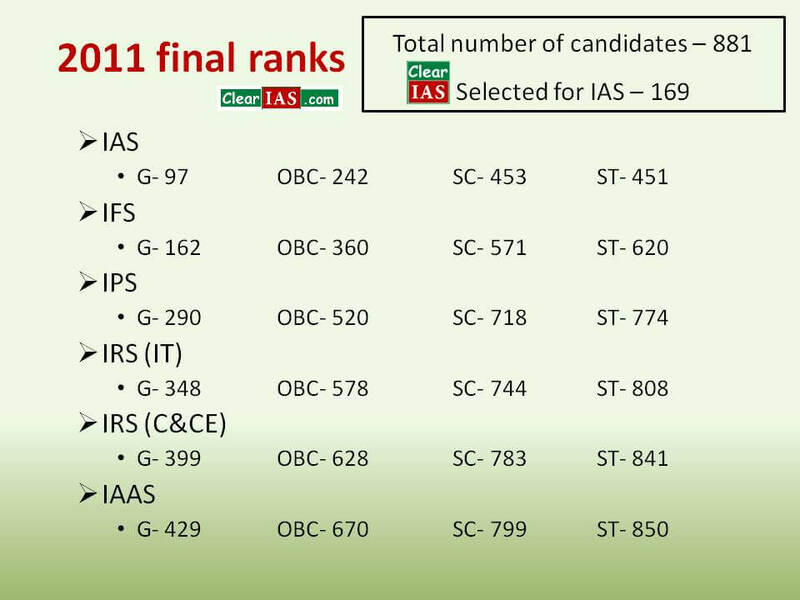 2013: Final Rank Allocated for IAS, IPS, IFS etc. In 2013, 91 was the last all-India rank, which fetched a candidate belonging to the general category IAS. At the same time, the last OBC candidate who secured entry into IAS had an all-India rank of 384. It was 534 and 802 for SC and ST respectively. 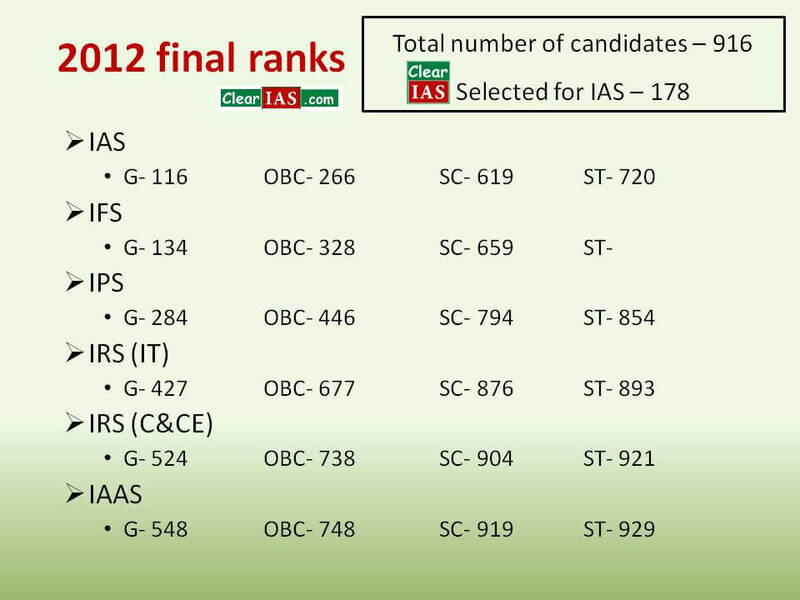 2012: Final Rank Allocated for IAS, IPS, IFS etc. In 2012, 116 was the last all-India rank, which fetched a candidate belonging to the general category IAS. 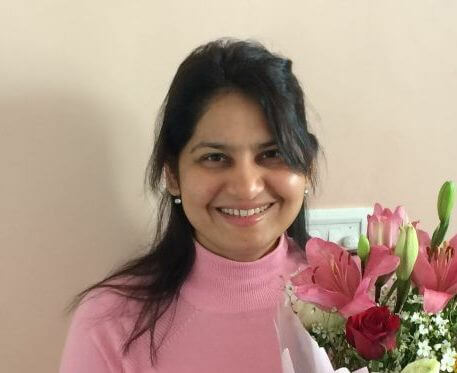 At the same time, the last OBC candidate who secured entry into IAS had an all-India rank of 266. It was 619 and 720 for SC and ST respectively. 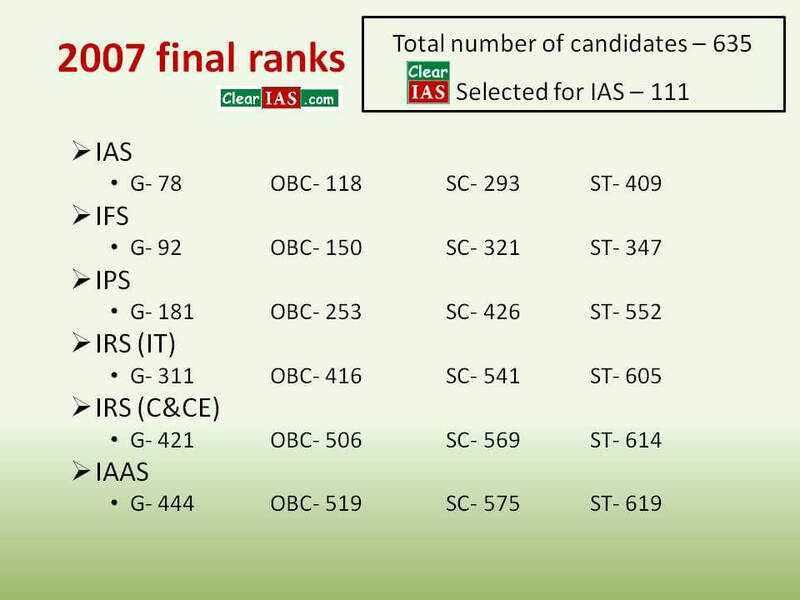 2011: Final Rank Allocated for IAS, IPS, IFS etc. 2010: Final Rank Allocated for IAS, IPS, IFS etc. 2009: Final Rank Allocated for IAS, IPS, IFS etc. 2008: Final Rank Allocated for IAS, IPS, IFS etc. 2007: Final Rank Allocated for IAS, IPS, IFS etc. The above-mentioned data are regarding the final ranks. But if you are looking for the Cut-Off Marks for UPSC Civil Services Exam – Prelims, Mains, and Interview, you may find our trend analysis interesting. It should be noted that the details mentioned above are based on the allocation of candidates to different services based on the first rank list. We have not included the consolidated reserve list (supplementary list) here. To understand the same better, consider the 2015 case. Though the total vacancies were 1164, UPSC in its first list recommended for allocation only 1078 aspirants and put 86 candidates on the reserve list. Out of 1078, due to various reasons, DoPT, considered for allocation only 1055 candidates, which we have mentioned in each of the tables as ‘Total number of candidates’. This should be understood as the total number of candidates considered for allocation. Again, it should be noted that in 2015, out of the total 1055 candidates considered for allocation, DoPT allocated only 969 candidates, due to various reasons like medical, lack of certificates etc. In short, getting into any of the 24 services is not easy! But we feel a proper understanding of these details will help aspirants to understand ground realities and prepare harder with a clear mind and sharp goals. hey dear admin i have got a lot of good things from you and still getting but what i am bemused over is that why are you posting slowly i mean there is good gap in your posts while i regularly check it………. there is no any criteria for u..
why there is disrimination with general caste till now after so many years of independence? And also because general categories are doing it till today. Because there still is discrimination with lower caste after so many years of independence…..
Because there is much more descrimination against sc/st in society which is more worse,let us remove caste system along with reservations and give it for the poor who deserve it. This reservation would lead to world war 3 india. Sir I’m a b.sc first year aspirant for this year and I want to start preparation for civil services from right now please guide what steps should I follow to get better outcomes for the bingo and I’m pursuing b.sc stats(hons) will it make any issue for the preparation or in any other conditions. I really want to prepare for the UPSC examination already from 1st year of my degree courses..but now i have golden oppurtunity for having a free coaching class for this examination..in my 2nd year..so please tell me how to prepared it.. Exactly Manpreet…… You are absolutely right… A person who of all odds became highly educated, who became first Indian to complete a doctorate degree overseas, whose phd thesis gave rise to our reserve bank of India, who is behind various big projects in India from which millions are benefited, who brought labour laws and gave powers to the workers than of the owners, who made working hours from 14 to 8, who gave every Indian women the right to inherit her father’s property just like the son’s do, who never wanted the reservation system to run in, who eventually became the first law minister of independent India and later wrote the holy grail we are so proud of named as “The Indian constitution”. Denied and rejected by many people of whom he considered his own country men just because of his caste….. He was a dalit in today’s world that comes under SC category later he accepted Buddhism… Many people like him still denied, reason-“lower caste”… And people literally dumb and no idea of whatsoever given higher status, reason-“higher caste”.. Yup you are correct.. India doesn’t give rank according to talent but according to caste. True. I think reservation should be only given to poor people which can include both sc/st/obc & General category. The reason is sometimes a rich sc/st/obc person gets 1st rank only because of reservation despite of having comforts (expensive coaching, best accommodation, best study material and much more), and on the other hand the poor general category person gets nothing despite of doing so much hard work with meagre resources. Reservation is given for the upliftment of the deprived classes who have suffered untouchablity from ages, so they deserve reservation for equal share of power in the society and on the other hand the condition of poor people belonging to general category should be improved by proper implementation of government schemes. idiot even getting 700 in not that easy in IAS. whoever gets it knows . its people like you who are using caste system as a topic to start a pointless debate . i am an IITian and here at one of the best colleges in India , i meet all kinds of people . i myself am an under 300 rank gen and still i respect 1500 gen rank(when in sc/st is 150) because i know if he got 1500 in gen ranking that means he deserves to be here . reservation are not there to pit different caste against each other but is a handy tool given to backward people to get back in the race . you might be thinking why not let the top gen rankers get the jobs , they will do better for country overall but its not about scoring 35-50 more more marks in exam , its about to keep diversity in all fields of life . even in engineering , a single product is made by efforts of people from different fields and not just cs (as most Indians think). in the end , its not just about marks and merits , never forget that you are a human and ethics matter as much as knowledge. so don’t post these cheap comments and do some study yourself instead of blaming your nation’s policies. That’s why india is not progressing because; the poor people who belongs in SC/ST category doesn’t get proper equality in the society… allow them to come up to the main stream of the society from ignorance and poverty … if so that we can imagine.. India can became a developed country within a short period… look at Gujrat and UP … What a pity against poor people of the society….. shame on you..
You are really dumb one Mr. RAJ and you really want to be the eligible upsc candidate. In Gujarat we are far mature than you. First clear your mind that you don’t care about ratio of beneficiaries from last 68 years. it’s simply base on politics not on SC – ST uddhar. It can make it in different ways. And what about the poor general category based public? What about their rights? If people should be treated as “equal”, then the reservation should be entirely removed. Dear sir does they reduce the upper age limit. But there are lot of ranks displayed in IAS…cant get it, I mean general- 96 and so on…after adding that its crossing limit..
96 is the last rank alloted to general category candidate, and 180 includes all the categories based candidates who are selected for IAS. Final rank. The total vacancies for IAS including reservation are only 180. Rohit sir, I respect your thinking and you are totally right……. You are absolutely right… right. in 2015 there is no any st student for IFS.why? Can I choose Agronomy as my optional subject? Does our posts depends on our marks obtained including final interview?? ?